About this objectThe Eve's artificial respirator or 'Eve's Rocker' used for resuscitation. The casualty is bound gently on the stretcher face down. 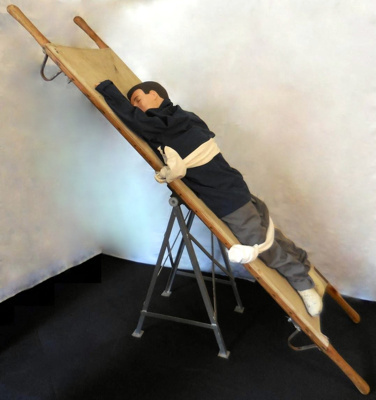 The stretcher is placed on the fulcrum and a rocking motion is started with a complete see-saw every 4 to 5 seconds. The see-sawing motion brings the abdominal organs up against the diaphragm when the head is down with enough force to push the breath out. When the feet go down, the organs pull down the diaphragm and the air is drawn into the lungs. St John Ambulance Historical Society of South Australia, the St John Ambulance Museum, 72 Edmund Avenue, Unley in 2013. St John Ambulance is part of the The Most Venerable Order of the Hospital of St John of Jerusalem. Learn more at the museum about the Order, formally established in 1113.